Gutters are an integral part of your roofing system. During heavy rains in spring and summer, they provide protection to your landscaping. In the winter, they channel snowmelt through your downspouts instead of letting water drip off your roof’s edge, freeze and cause a slipping hazard on sidewalks and driveways. If you’re replacing your roof, you should consider replacing your gutters. If your home doesn’t have gutters, consider adding them for a finishing touch on your home’s exterior. Landscaping protection – Instead of water running off your roof’s edge into your landscaping and mulch, the water goes down the gutters and downspouts. As a result, your mulch stays where it’s supposed to stay, saving you from constantly replacing it or raking it out of your grass. When flowers and shrubs are constantly battered by water cascading off your roof, they suffer and need to be replaced more frequently. Protects your home’s foundation – Whether your home is built on a slab or crawlspace or has a basement, heavy rains running off the roof can cause damage. Properly functioning gutters keep water out of your basement, saving you from water damage and flooding. In a crawlspace, standing water can cause mold and other moisture problems. A house built on a slab that has too much standing water can suffer from soil erosion, which eventually may cause a shift in the foundation. Keeps you dry – Have you ever run into your home during a rainstorm? The water running off the edge of your roof can be like a waterfall. Adding gutters helps you and your guests come and go without a deluge of rain off your roof. 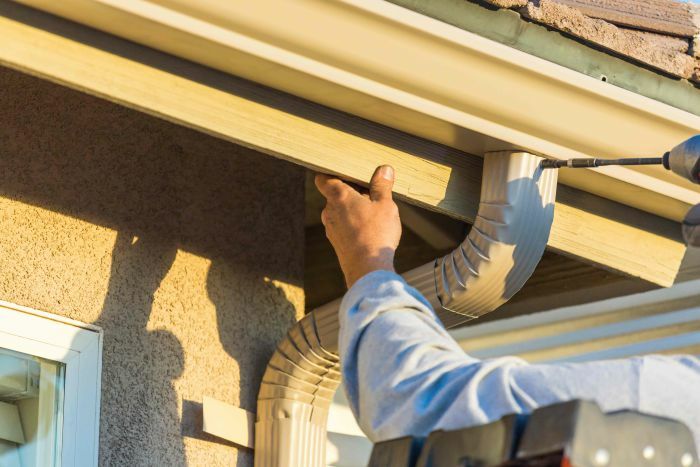 If you currently have gutters that sag, leak or aren’t securely attached to your home, it’s time for new ones! Our estimators can provide you with a gutter replacement cost and customize the gutters to coordinate with your home. We custom-make your gutters for less waste and a perfect fit. Call for your free quote today at (937) 907-0009 or submit our online request form.